Five What Hi-Fi? Awards champion budget to high-end speaker packages | What Hi-Fi? Five speaker packages take home Awards this year – the first time we’ve dished out that many since 2015 – with new categories catering for budgets at either end of the spectrum. At under £500, it isn’t only the price tag that grabs our attention with Wharfedale’s DX-2 package. 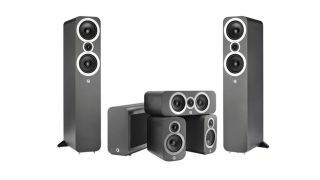 With plenty of detail and dynamic punch, alongside sonic heft belying its diminutive stature, this budget 5.1 system was a shoe in for an Award the moment we heard it earlier in the year. You could buy 25 of those and still have change for bookshelf of Blu-rays for the price of the PMC Twenty5 23 5.1 package that takes our most high-end Award. In fact, it’s the most expensive of all the more than 100 winners this year, but its faultless performance as part of our new reference system has made it impossible to ignore. The biggest winner, though, is Q Acoustics. The British manufacturer dominates the mid-range with Awards for best speaker package between £500 and £1000, for its 3010i 5.1 Cinema Pack, and between one and two grand for its sister package incorporating the wildly entertaining 3050i. It hasn’t been kind on our backs, but the fact there has been so many products in contention for an Award this year has really heated up the race for the ultimate prize. Last year it was Monitor Audio’s Silver 200 AV12 suite named Product of the Year, and that being the only package to retain its Award this year – for best speaker package between £2000 and £5000 – means it could be any of these five superlative winners to be crowned champion of champions. Luckily, there is less than a month to wait to find out. All of our Product of the Year gongs handed will be out on Wednesday 7 November, and we’ll keep you updated as the winners take to the stage.